2014 witnessed the 250th anniversary of the death of two violin virtuosos: Pietro Antonio Locatelli (Bergamo 1695 – Amsterdam 1764) and Jean-Marie Leclair (Lyon 1697 – Paris 1764). The influence of Locatelli’s output on the development of violin composition lay in the sphere of virtuosity. 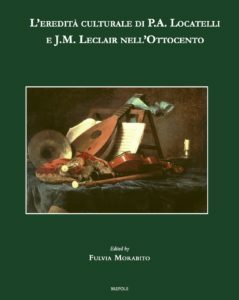 The present book explores the figures of Locatelli and Leclair, circumstantiating their relationships and developing new perspectives onto them. The two virtuosos provide a suitable starting-point from which to investigate the violin bravura tradition, which, beginning in Italy, spread through France and the rest of the xix century Europe. The volume thus encompasses articles dedicated to Artôt, Baillot, Guignon, Guillemain, Mondonville, Pagin, Rode, Spohr, Tessarini, Tartini, Ysaÿe. The authors are: Sallynee Amawat, Fabrizio Ammetto, Alejandra Béjar Bartolo, Paola Besutti, Gregorio Carraro, Étienne Jardin, Walter Kurt Kreyszig, Candida Felici, Priscille Lachat-Sarrete, Simone Laghi, Alessandro Mastropietro, Fulvia Morabito, Paola Palermo, Rudolf Rasch, Renato Ricco, Rohan H. Stewart-MacDonald, Michael Talbot, Guillaume Tardif and Neal Zaslaw. Published with the Assistance of Fondazione MIA (Bergamo) and Fondazione della Comunità Bergamasca (Bergamo).